Join our certified instructors in the pool for a fun and challenging workout. Greater mobility, reduced pain and fatigue, increased muscle strength and enhanced sleep quality are just a few of the benefits of a regular fitness workout in the pool. 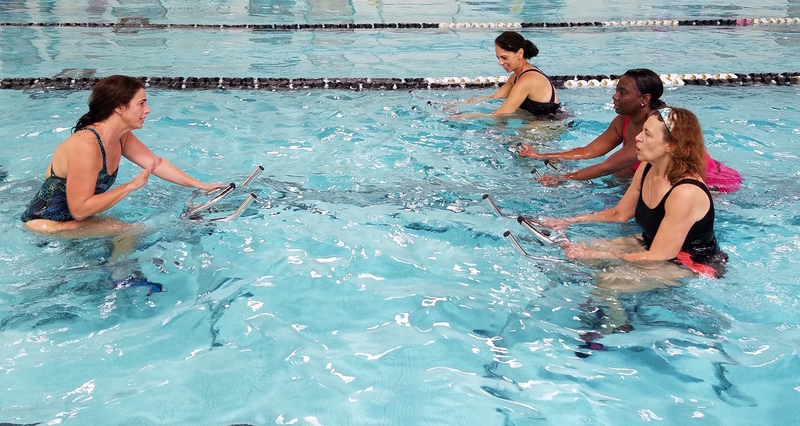 Work at your own ability level during a variety of water exercise classes with the encouragement from friendly, welcoming classmates. Intense full-body cardio and abdominal workout in deep water with buoyancy belts, noodles, barbells, and balls.Ideal for rehabilitation and injury recovery. Rigorous shallow water exercise. Intended to help you burn fat, tone muscle, and improve cardiovascular function with noodles, barbells, dumbbells and noodles. Belted deep-water cardio exercises that focus on body and strength. Shallow water exercise with dumbbells and exercise boards to improve and strengthen mobility. Gentle paced and individualized exercises. This class is geared towards people with mild to moderate disabilities, such as MS. Barbells and noodles will be used to help with balance, core work, strengthening, and stretching. Therapeutic toning & stretching in the Therapeutic Pool. Beginner to Intermediate level class for individuals interested in water aerobics. Must be able to float. For those with arthritis, chronic health issues, surgery preparation or recovery, and new to exercise. Exercises are built around balance, improving flexibility, increasing range of motion, and personal strength. Water is used as resistance along with barbells. Non-impact, non-aerobic exercise in the Therapeutic Pool designed to strengthen all body parts. Perfect for those who have had a previous injury, surgery or a chronic health issues. Low-impact, low intensity head to toe workout performed in the Therapy Pool. Class is designed to improve range of movement for daily activities and increase energy level. Aerobic workout utilizing buoyancy belts. Focus is on cardiovascular fitness, overall strengthening, toning and range of motion. Low intensity shallow water exercise with use of noodles and barbells. Focus is on core strength, range of motion and an overall toning of the body. An intermediate to advanced level class. Emphasis on core strength, range of motion and toning of the body by performing high intensity exercises in both deep & shallow water. Must be able to swim. One hour of intense deep & shallow water exercise, helping make you more flexible and fit. A cycling class in the pool. A challenging cardiovascular and total body workout. Excellent for rehabilitative effects and a low impact form of exercise. Water shoes and bathing suit required. You’ll work to develop skills through workouts and game play. Water Polo is offered for two age groups: Teen/Young Adults 13 years and over, or Masters 30 years and over. Everyone is welcome to join in!